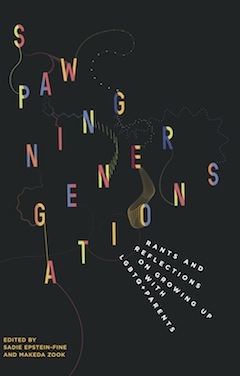 Sadie Epstein-Fine and Makeda Zook will be in Vancouver for the Jan. 17 launch of Spawning Generations: Rants and Reflections on Growing Up with LGBTQ+ Parents (Demeter Press, 2018), which they co-edited. In the book’s introduction, Epstein-Fine and Zook explain that the term queerspawn to describe someone who has one or more LGBTQ+ parents was coined by Stefan Lynch, the first director of COLAGE, an American “network dedicated to connecting and supporting queerspawn,” which has one chapter in Canada (in Toronto). “By giving a name to our identities and experiences, he laid the foundation for connecting and politicizing queerspawn; Lynch gave us a term to organize around,” they write, acknowledging that the term “is not without controversy. Although some people feel empowered by reclaiming both words (‘queer’ and ‘spawn’), others do not like the association with ‘spawn of the devil.’” Another term, “gayby,” also has its proponents and its critics, those who “find it infantilizing and only representative of people whose parents identify as gay,” note Epstein-Fine and Zook. Epstein-Fine was born in Toronto in 1992 to two moms, in an activist home, “surrounded by 11 other women.” She carries on her family’s activist tradition and describes herself as a queer(spawn)-political theatre maker. According to her bio, Zook “was born in Vancouver in 1986 to her two lesbian feminist moms. She was raised in a mixed-race family surrounded by anti-oppression politics and her OWLs (older, wiser lesbians).” She works in sexual health promotion for a feminist nongovernmental organization. Epstein-Fine shared with the Independent how she and Zook came to be the editors of Spawning Generations. “Demeter Press approached Makeda and I to edit the anthology because they saw a gap in their literature,” she explained. “They mostly publish books about motherhood, through a feminist lens, and they realized that, while they had a lot of literature about queer parenthood, they didn’t have anything from the children. This is a trend in the majority of queer parenting literature – we hear a lot from the parents, but rarely from the kids raised in queer households. “Yes, it’s true, Makeda’s and my primary focus is not editing. Previous to editing this anthology we were both writers, which is how we got connected to this book. Our (queerspawn) community is small and disparate, there is not a plethora of options available. When Demeter first approached me with this project, I tried to think of folks who could do this project, and there was no obvious answer. And the pair has done a commendable job in keeping the essays on point. The editing is such that each contributor maintains their own voice, which adds to the book’s readability and interest. Contributors range in age, from 9 years old, to teenagers, to 20-somethings and older queerspawn. And the writers come from all over the world, from as far away as London, England, and as close as Victoria; one was born in Vancouver but seems not to live here anymore. While all the contributors have being the child of one or more LGBTQ+ parents in common and have shared some similar experiences, each story is unique. “There was a call for writers, which we spread as far as we could,” Epstein-Fine explained about how the essays for the anthology were chosen. 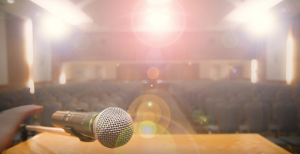 She said they asked COLAGE and several organizations and people they know in Canada to publicize the call, which went out in the winter of 2015, with a due date of May 1 that year. The Spawning Generations book launch takes place Jan. 17, 7 p.m., at Massy Books, 229 East Georgia St., in Vancouver. For more information, visit facebook.com/spawninggenerations.